The M.V.Khrunichev State Research And Production Space Centre (GKNPTs), headed by Director General Anatoly Kiselev was organized in 1993 on the basis of one of the largest machine- building works engaged in the production of space-rocket equipment - the M.V.Khrunichev Machine-Building Factory. On April 30,1916, in Moscow, near the Intercession Church in Fili, the Russian-Baltic joint-stock company founded a plant for production of Russian automobiles, which in 1917 was named "The Second Russo-Balt Automobile Plant". Later, the plant was given in concession to the German company "Junkers" and the first 50 Ju-20 airplanes were produced here. Since the mid-1920s, the development of the national aviation technics started. The ideas of the aircraft designer A.Tupolev and his disciples A.Arkhangelsky and A.Petlyakov were put into practice. In August 1929, the flight Moscow - New York was undertaken with the TB-1 (ANT-4) plane, constructed on this plant. 20,000km were covered within 137 hours, that set up the world speed record at that time. In 1931-1935 the serial production of a 4-motor bomber TB-3 (ANT-6) was launched. In the post-war period, the development and serial production of the 4-motor bomber Tu-4 "Flying Fortress" was started. It was the first to have radiolocating equipment installed aboard. In 1951, the design office headed by V.Myasishchev was established in the plant, later named Salyut Design Bureau. In 1951 through 1960, it created the M-4 and 3M bombers, the latter also known abroad as "Bizon", and supersonic bomber and missile launcher M-50. In 1960-1961, the plant has developed and produced the M-6 helicopter by the aircraft designer M.Mil. 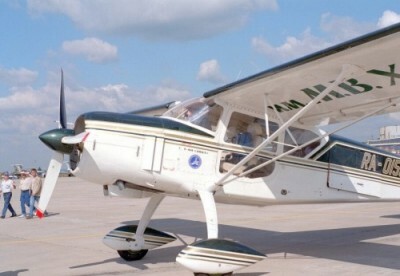 First designed in 1992 the aircraft flew a year later. The fuselage is of tubular steel and the metal wings are fabric covered. 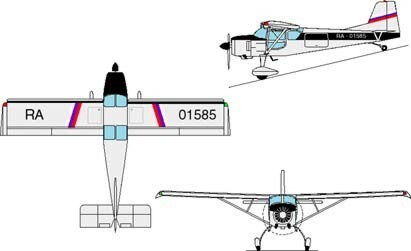 This STOL aircraft can be fitted with wheels, skis or floats. It is built at the MIG factory at Voronin Russia.